At the end of the day, having a home is important. Having family is important. Appreciating the blessings we enjoy is important. However, that does not mean that a home does not need updating or that a growing family does not outgrow its walls. When the time comes to find a new home, or if there is a need for updating your existing home, don’t let stress get the better of you. Along with the costs of setting up a new home or remodeling an existing one, there are real benefits in the homemaking experience. Those benefits are to be enjoyed. Are you in the midst of a house decision or considering your next move? If so, here is some common sense advice you may want to keep in mind. It is extremely rewarding to move into a house that you have had designed and built. To achieve that reward, there is a lot of work to do. Anyone who has contracted to have a house built will tell of their excitement, as well as their story of long hours, endless decisions, and countless opportunities for cost overruns and budget discussions. But, once it is finished, your house is ready to be turned into your brand-new home. BRAND new. What are some of the key decisions to make to ensure your homebuilding experience goes as smooth as possible? Meng encourages new home builders to first carefully consider their choice of general contractor. Says Meng, “The single most important decision you can make, aside from your budget, is who you decide to have build your home. You are going to trust this person and his or her company to help you complete one of the most important projects in your family’s financial life.” That is the case for most single-home families. A good contractor/builder will help you navigate the process of building a new home and help you manage expectations of timelines, budgets, and unforeseen steps in the journey. A great builder will be proactive. You certainly want a great builder, especially if you are new to the process and require any hand-holding. Buying an existing home is far easier on the management and timeline side since it is already built. Assuming there are not significant, time-consuming repairs to be done, the biggest challenge is finding a house that someone else built to their tastes that will suit your family and your budget. If you want to be in an established neighborhood with no new lots for sale, buying an existing house may be your only option. Shopping for a new existing home is always a challenge. Utilizing a real estate agent is always a help when arranging inspections, valuing property, and negotiating a sale. A real estate agent can also be essential if you are strapped for time and have to make the most of your shopping days — especially if you live out of town and do not know the area. With the right help, patience, and a bit of luck, you may be able to find a house and community that suits your family. And, if it is almost right, you may be able to do a little remodeling to make it home. Nothing spruces up a home like a few updates. Remodeling is often your best option. Even if you have been considering finding a new home, bringing your home up-to-date can buy you some time, improve value, and shorten time on the market should you decide to put it up for sale. Painting is always a basic, inexpensive way to make a big visual change. New floors are a change that bring you up-to-date quickly. And, while hardwood floors are risky in rooms with water appliances — the kitchen, bathrooms, and the laundry room — there are now ceramic options that give you the look of hardwood and the durability of tile. These floors are also highly resistant to scratching and pet wear and tear, common issues with wooden floors. Closet space, particularly in the master bedroom, is a great focus area. And, if you have a fireplace, updating the mantle can have a great impact and change the tone of a room. Bathrooms are not only one of the best return-on-investment areas to update in your home, but they also offer some great options. Bathroom remodels can be as simple as changing out faucets, towel racks, and other hardware. Or, you can make dramatic changes with updated granite counter tops, new flooring, enlarged showers, and whirlpool tubs. Remodeled bathrooms can not only brighten and update your home, but they also can add to resale and increase marketability. In today’s home, the kitchen takes center stage. With the addition of space for a “keeping room,” kitchens are now decorated and furnished with sofas, chairs, and media centers. The kitchen has become the new central living space, complete with entertainment, cooking, and gathering spaces. There are several areas in a kitchen that need attention for real updating. Countertops, appliances, walls, and floors are still great areas to focus. All of these areas need to be current to bring your kitchen up-to-date. If your kitchen does have keeping area space, then walls and entertainment fixtures, such as a television and (possibly hidden) surround sound, and furnishings will bring the area to life. There are few projects that can mean as much to your family financially as your home investment. And, the investment is not just financial. In creating your home you are creating a space for lifelong memories, where your children grow up and life happens around you. An investment in a home is an investment in family. A great contractor will make the difference in your building experience and deliver your dreams. Your family, of course, will make the home. Jim Meng is the owner of InVision Construction. He is a father and a grandfather. 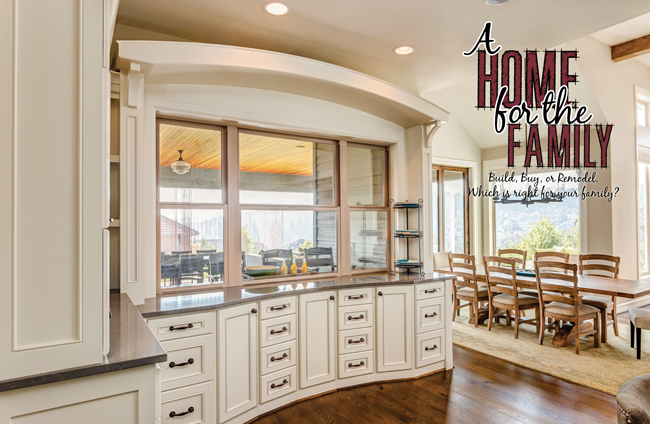 His company helps families in home construction and remodeling. For questions and information on hiring the right contractor, contact Jim Meng at 601-376-9654. You can also visit the company’s website at www.invisionconstructionllc.com.